We decided to take queso to the next level. Fortunately the preparation wasn’t epic; it is incredibly simple to make your own awesome queso at home. 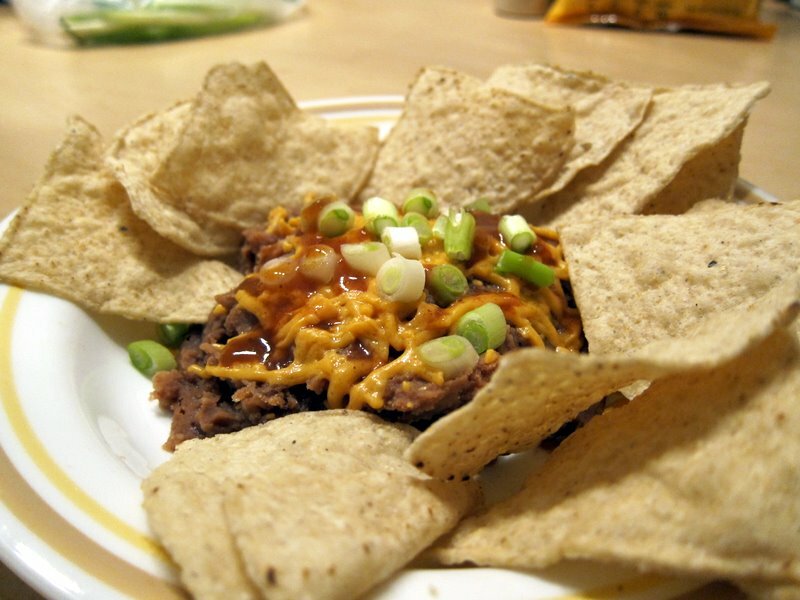 You can start with Nacho Mom’s Vegan Queso or any other pre-made vegan queso or make your own. Then we microwave it until it’s hot, stirring every thirty seconds. This is perfect for a gathering with friends, even omnivores! Nacho Mac&Cheese: Not your Ordinary Mac and Cheese. This was an evening when the man-meat and I just wanted to chill out so we made something super fast. 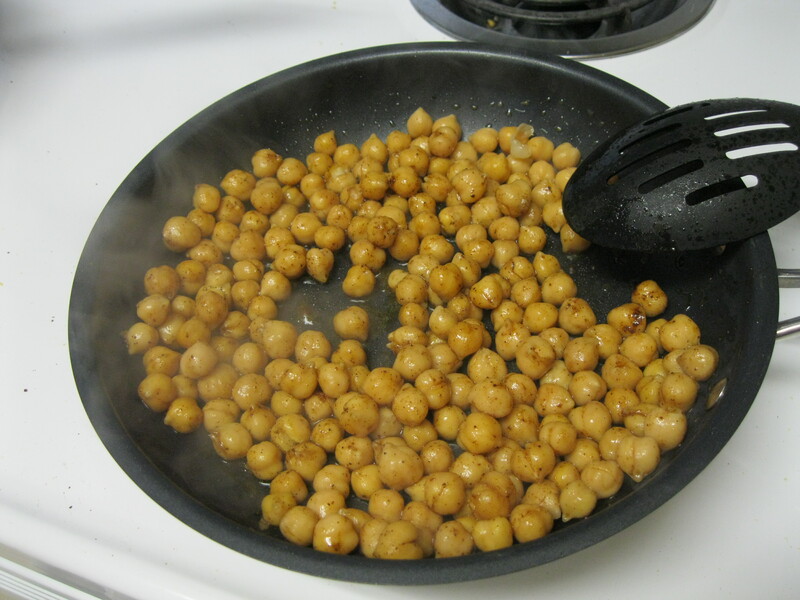 Brent prepared the pasta (as I’ve noted in previous posts, I can’t be trusted with parts of a meal that require patience) and I added a tablespoon of olive oil and about 2 cups of chickpeas (1 cup of dry beans, soaked or 1 can, drained) and fried them lightly with some chili powder. 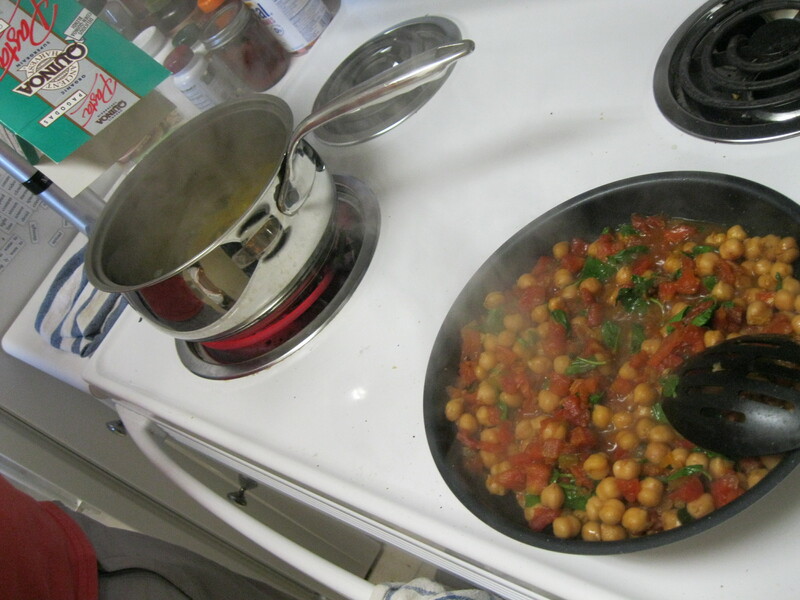 To this I added a tin of diced tomatoes. I used a tin of “Rotel” mild with diced green chilis. After this was looking and smelling amazing we shredded some basil (cilantro would have been better but we didn’t have any) into it and then added the cheese. 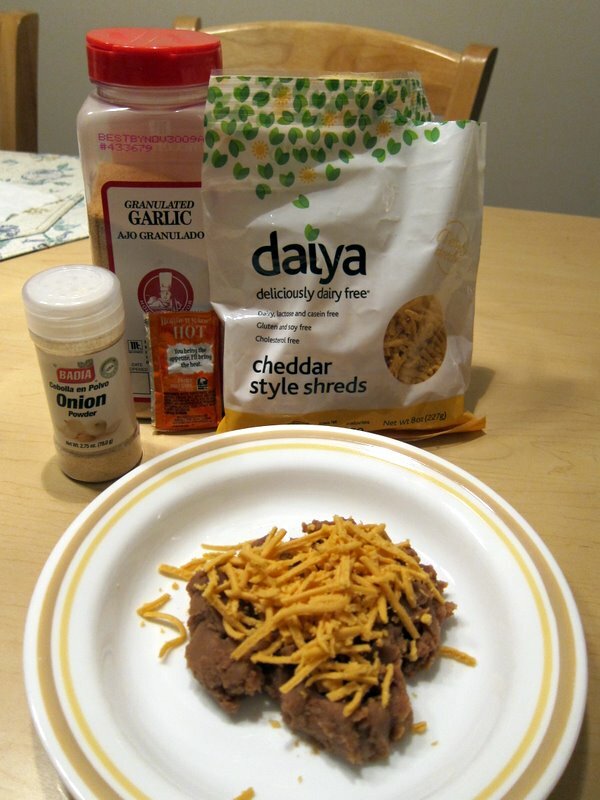 You can also add some nutritional yeast for a flavor boost and nutrients. This cheese is called “Ste. Martaen” and we used their pepperjack variety. I don’t like this cheese for eating: I find the texture disturbing. 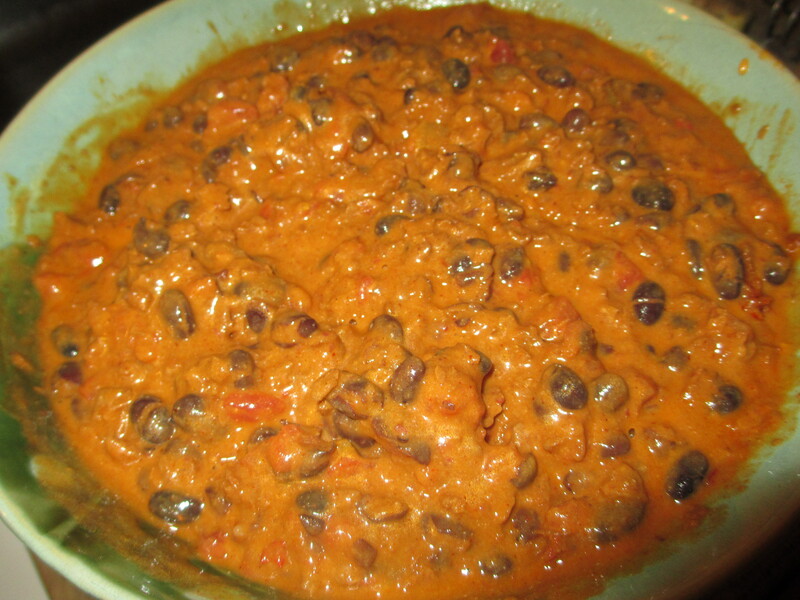 It’s great for cooking since the flavors are fabulous and it melts well. 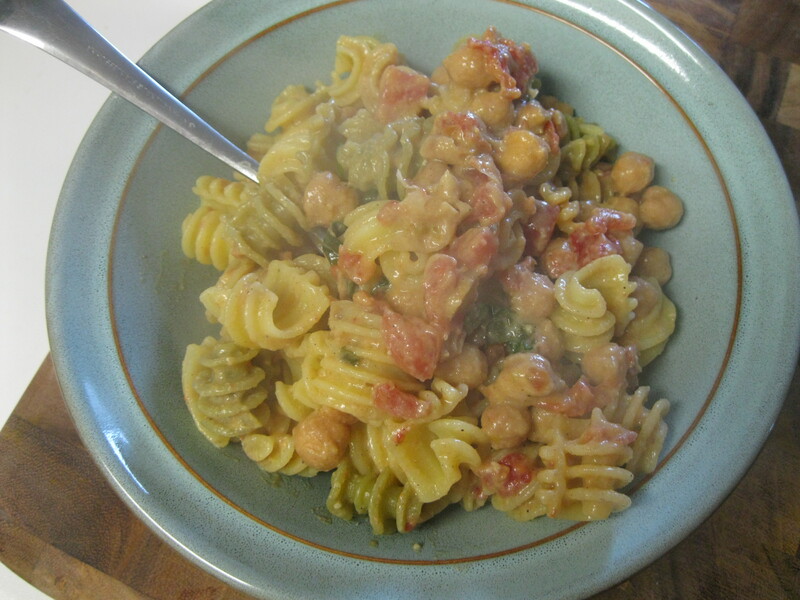 It’s made with an agar base (that’s a seaweed based gelatin, very sustainable and low calorie) As you can see, we’ve got a cheesy mass of chickpeas and tomato that’s still very low in calories, cholesterol free and high in nutrients like protein, vitamin C, and fiber and we haven’t even added the quinoa pasta yet! This is the finished product. We devoured it and vowed to make it again. 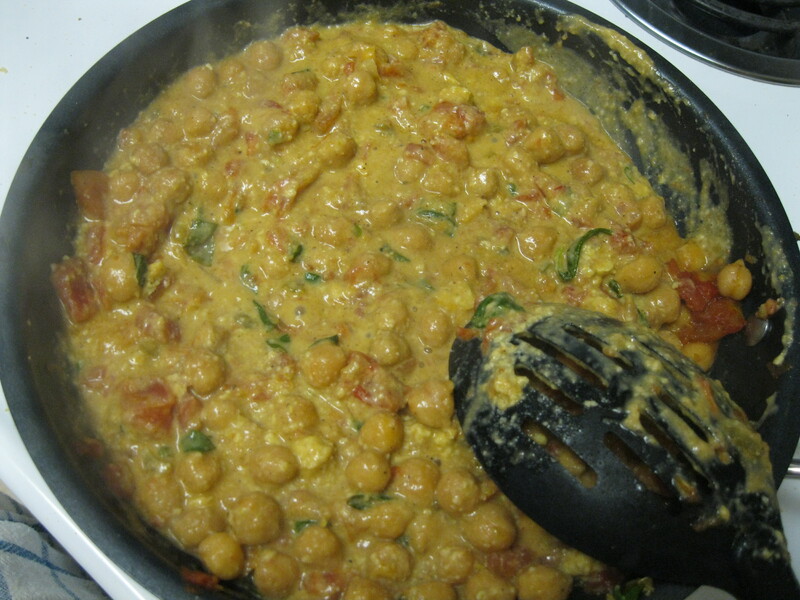 The creamy sauce was spicy and cheesy and the bite of the peppers was balanced by the smooth chickpeas and mellow tomato. I almost hate to admit this, but Taco Bell has become a fast food savior of mine since transitioning to a vegan diet. I can only eat so many French fries and 6″ veggie delight subs. Taco Bell rises above the rest for one reason: beans. A bean burrito, no cheese is super cheap, tasty, and vegan — no lard, you guys! I have also ordered nachos with beans only (which has to be announced to the entire staff for some reason). 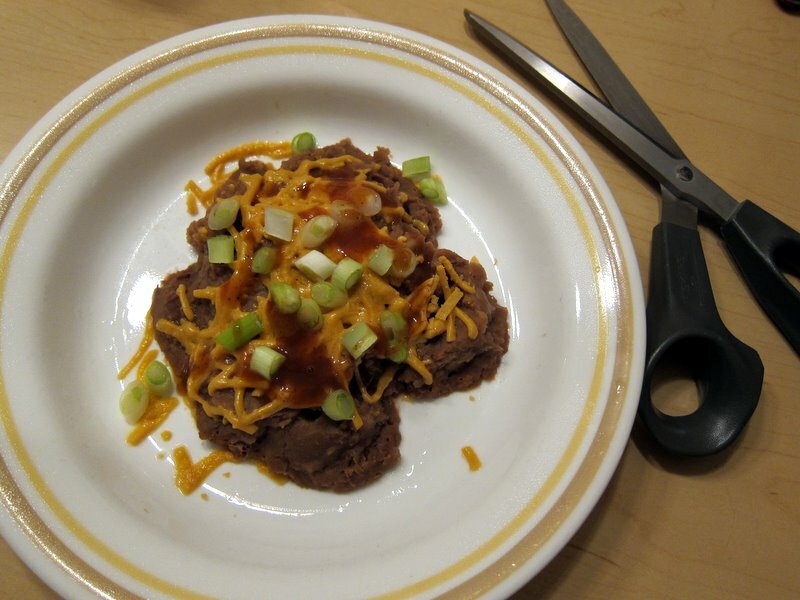 I was itching to have some refried beans at home, so I went to the store to buy a can. I spotted the Fat Free can first. Fat free? No way! So I picked up a can of Traditional style refried beans. I read the ingredients. LARD. No way! I checked out the Fat Free Can was delighted to read that fat free meant no lard and simple ingredients. Yay! Now, you may be thinking that I could have started with a can of pinto beans. Yes, I could have. 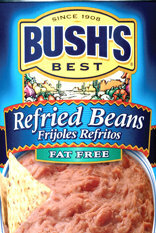 For convenience, though, a can of Bush’s Fat Free Refried Beans is perfect. Put your beans in a microwave-safe bowl. Add your seasonings and smoosh it in with the beans. Top with the cheese. Microwave, covered, for about a minute (use a bowl so that the cheese doesn’t melt onto whatever cover you use).